Norris H. Williams’ research on the molecular systematics of orchids has led to major reclassifications and clarifications of relationships within the orchid family. He is a world-renowned authority on the systematics, morphology, molecular biology and evolution of orchids, as well as the pollination biology of orchids and other plants with special floral fragrances. Williams’ main research initiative since 1997 has been on the molecular sytematics of orchids, particularly those from the New World tropics. 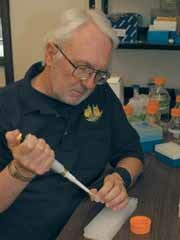 His research was initially funded by the American Orchid Society and now by the National Science Foundation. Prior to 1997, Williams used gas chromatography/mass spectrometry to characterize floral fragrances and identify their component chemicals. Future research initiatives include using molecular systematics to study coevolution of plants and their pollinators, especially bees, and to investigate the role that deceit versus reward has played in the evolution of pollination systems. Williams is a major contributor to GenBank and operates a heavily used website on Maxillaria, a large group of neotropical orchids. He has made the Florida Museum of Natural History’s Herbarium a center of botanical research at UF by maintaining and augmenting the specimen collection, the library and the laboratories. “As a scientist, I am overwhelmed at [Williams’] overall knowledge of plant biology, both in the field and laboratory,” says natural history department Chair David Steadman. “Not a single one of my many plant questions has gone unanswered.